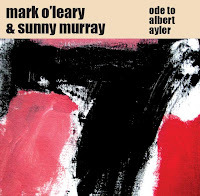 This is the second duo recording of Irish guitarist Mark O'Leary on Ayler Records, the previous was with Han Bennink, this one with Sunny Murray, two totally different drummers in terms of style. Murray has surely more souplesse and is surely less hard-hitting, playing a more supporting role than Bennink did on "Television". The recording itself goes back to 2002, during a tour of Ireland. The album consists of three long tracks, with two short pieces in between. O'Leary has developed his music in the meantime, but there are some fantastic moments here. Especially when the spirit of Ayler descends on him. Ayler was raw, wild, fierce, brutal even at times, tearing down all the elements in music that could hinder any direct straight-from-the-heart authenticity, and by doing so, he created a spiritual sensitivity, ripped to its barest essence. O'Leary and Murray do that too, to a certain extent, and that's when they are at their best: when there is an unrelenting drive, as on "Albert", the first track, together with the last one the best piece on the album. O'Leary really goes wild here, especially towards the end, sounding more like McLaughlin in his early period than Ayler, but well, it's certainly great. "Body Politik" is more jazzy, more gentle, until halfway, when some distorted guitar brings about a change in the piece, speeding up the pace, moving more into rapid-fire fusion-like guitar. '"Spiritualized" is a short acoustic piece, offering a kind of breathing pauze, before the pièce-the-résistance begins, called "Axiom", a pieces that starts slowly again, with nice polyrhythmics from Murray, and gentle, sensitive playing by O'Leary, but then tension rises, as does the tempo and the speed, with both musicians going totally giving themselves. So, while the music is not bad, the format is a little repetitive, and some of O'Leary's phrasing too. As said, he has grown better since then. The beautiful news is that a number of potential donors have stepped forward; deepest blessings. The first is in the process of being screened toward potential transplant surgery. Medicare policy (David's principal insurance) is rather evidently that only one donor at a time may be screened. It is both David and this donor's hope that all may move toward this transplant. The screening process takes time as has been made apparent. David is in stable condition and continuing peritoneal dialysis at home. His spirits have been brightened in the past week and a half by all of your responsive energy, and we remain optimistic. When the time comes, we will send out a notice in response to the many inquiries we've had for donations toward further direct support. to all who we haven't yet reached with it. Solo trombone records are rare things, but a solo bass trombone record must be unique. And the music is too. 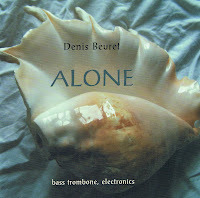 Swiss trombonist Denis Beuret not only masters the full five octave range of the instrument, he uses double sounds and sordines, he uses all sorts of different embouchures - for clarinet, sax, tuba, flute, and last but not least, he uses a wide array of live electronics to make loops of the sounds he creates. When listening to the record for the first time, I thought it had been dubbed, and over-dubbed, in several layers, with some sounds created to add percussive background, with repetitive themes to create a lyrical backbone, and then several improvisations over this. Surprisingly, these are all live improvisations. Invented on the spot, yet sounding as if careful preparation went into it beforehand and long polishing in the studio afterwards. That's the astonishing fact. This feat, and the quite coherent musical vision that Beuret creates with his perfect one-man marriage of human virtuosity and electronic effects, is really admirable. This isn't entirely jazz, this is more related to new music. Some pieces are quite hypnotic in their repetitive melodic drone, such as "Nouvloop03". On others, like "Nouvloop02", some of the sounds are gut-wrenching, leading to a quite wonderful listening experience. Other tracks are fun, like "MaxLoop03", yet not all tracks are of that same high level, or at least not all of them have the same direct appeal to me. 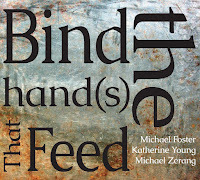 A must for trombonists, a more than interesting albums for the rest of us. Buy from Leo Records, or download from Lulu.com. Take two of today's most experienced modern trumpeters, add a rhythm section that is among the best you can get, make absolutely sure these are four strong characters with a sometimes idiosyncratic approach to music, and then make them improvise together without restrictions. Oh yes, a double restriction: every note counts, and the total sound too, the first is the too-small-for-the-microscope quark, the other the macro-level up to the size of the universe. So you know this is not your usual jazz CD. Trumpeters are Herb Robertson and Dave Ballou, also active on other paraphernalia such as electric megaphones, plastic hose, a variety of mutes & attachments, not to mention the more expected cornet, piccolo trumpet and flugelhorn. Drew Gress is on bass and Tom Rainey on drums. The music is open, abstract, often centred around the moment, and yet ... there are lyrical moments, on which the trumpets soar, and structured moments, where the four musicians play towards a build-up, feeding on each other's ideas to slowly create tension and grow the intensity of the piece. The music is not comparable to his previous albums. It is less grand, less expansive, with shorter and more focused pieces, and those truly gives this dual and ambiguous sentiment of being close and intimate, while being very exploratory at the same time. Sometimes great, sometimes interesting, always compelling. Buy from Ruby Flower at a temporarily reduced price of $12. 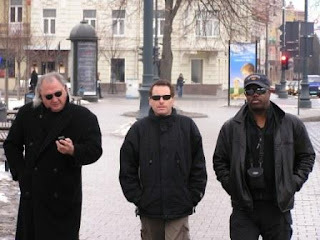 Jacek Kochan's "Another Blowfish", with Eric Vloeimans and Piotr Wojtasik. 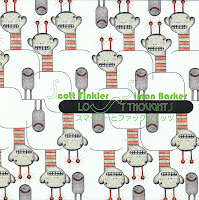 Since I listened to Australian trumpeter Scott Tinkler's "Backwards", I started looking for more of his material, and I bought this little gem, with Simon Barker on drums: a set of nine improvised pieces, ranging from three to fifteen minutes. 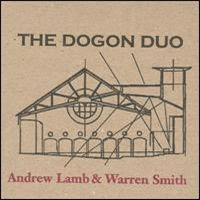 In the genre, of trumpet-drums duets, this is surely one of the best you can get. Both musicians manage to keep the attention going, full of intensity and energetic interplay. Tinkler's playing is full-toned and warm, despite the adventurousness of his playing: a rare combination. 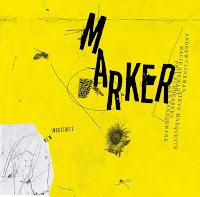 To make things even more spectacular, Barker's drumming is a real treat, tribal, shamanistic, hypnotic, full of contrast, in sound often more with a rock attitude, if it were not for the rhythmic refinement, hard-hitting and subtle. He knows when to use silence too: another rare combination. So when these two guys play together, something happens: there is electricity in the air, tension, rhythm, wild excursions and more contemplative moments. Some moments are telepathic, others are unique. The highlights are the very long second track with the undecipherable title which is full of variation, and the wild seventh piece, "Diminished", with offers the fiercest clever drumming I've heard in a long time (or the cleverest fierce drumming if you want). No weak moments on this album, and both musicians give themselves to the full, technically and musically, emotionally and physically. Great. Last week I listened to some new sax trio albums I received. Although the jazz was more free than mainstream, and the playing was good, it was also clear that they would not rise above the average, and hence I will also not review them. Then I listened to this record, which brings avant-garde saxophonist John Butcher in the company of drummer Gerry Hemingway. The latter has a broader scope of music, from modern jazz to electronics. Now, the paradox which came to mind when listening to this album is the following: although the music has without a doubt a more limited audience than the sax trios I listened to, it is far more memorable, and may hence reach more people over time than a more accessible album may do today. That's of course also the musician's dilemma: do I push the limit and risk alienating my audience today, because I want to make an artistic statements that might be hard to swallow for many, or do I make concessions, and make sure I have an audience today. But that may also be a false assumption. Because here's the other paradox. In order to come to the critic's attention, you have to make a strong musical statement. If not, you're just part of the pack that remains without reviews, hence without audience. But for those who think that grabbing the critic's attention by making something strong and shocking for the sake of it, don't even try. I tell you, there's lots of those around too. So, what am I trying to say is nothing less than do what you believe in, and do it well. Now about the album. 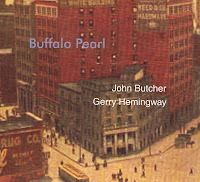 Both Butcher and Hemingway lead us to some strange aural territories, where sounds and emotion are the only ingredients. The key element is tension. Some moments are beautiful, others are really painful to the ear, but there's no moment of indifference, no moment of boredom, no predictability, only tension, stretching notes, stretching the sound possibilities of the instruments, stretching them so far you think they could snap at any moment, yet it doesn't, the tension remains, and new elements arise, surprisingly, out of the same sounds, but different. Two masters of their instrument, interacting fiercely and with sparks flying around. For those with open ears. Buffalo Collision is a superband of modern jazz musicians with Bad Plus members Ethan Iverson on piano and Dave King on drums, and complemented with Tim Berne on sax and Hank Roberts on cello. Berne and Roberts are musical innovators, not afraid to boldly go where no man has gone before, not always successfully, but at least daring to jump. Iverson and King are also innovators, but then of the less daring approach, more "inside" than "outside", at least that's what I thought. With Buffalo Collision they bring something unusual, music which is totally "outside", fully improvised, while remaining accessible. 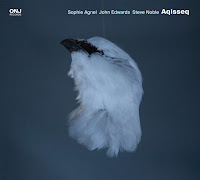 The four musicians bring minimalist approaches of spontaneous interaction, creating a wonderful and warm combination of melodic, slow undulating layers of eery, recognisable yet unfamiliar sounds. The first piece is a 36 minute long progressive build-up of musical tension, with explosive bursts of relief once in a while, yet the tension remains, in the implicit rhythms, the shards of sounds, the percussive cluttering, evolving into a dramatical intense middle piece, when the cello takes the lead, supported by percussive piano and almost march-like drumming, followed by a nervous solo by Berne. Sure, Berne and Roberts have been in these regions before, but I am perplexed by the agility of Iverson and King to offer a perfect fit for this special musical excursion, which after 25 minutes of tension actually explodes, forcefully, but magnificently, dramatically, and when the dust settles, sensitive beauty emerges in slow, almost repetitive hypnotic sax phrasings, which after a last emotional outburst dies down in ever quieter interplay. The second piece starts with a steady rhythmic left hand on the piano, with irregular right hand, inviting the cello in, hesitatingly, welcoming, and again King resists the temptation to go for traditional rhythmic support, rather accentuating the proceedings than building a foundation. Berne lets loose here, unleashing his energy, but without overblowing, keeping things controlled and passionate at the same time. The third track is close to 25 minutes, again as open as the first one, again as lyrical and as full of tension, and after the intense middle piece, the band creates the musical equivalent of layers of mist at sunrise, multicolored, slowly moving yet immobile, refined, subtle, and of a wonderful aesthetic, a reverie out which the listener is awakened by some tribal drumming and classical cello. It's hard to describe, but these guys have it all. The breadth, the ideas, the skills, the interaction, the sensitivity, the subtlety, the surprises. A collision indeed. Released just at the end of 2008, let's give it credit for 2009, and it will surely be on the list of albums of the year. Listen to "2nd Of 4"
Watch a performance in Brussels last week (the CD sounds better, I must say). 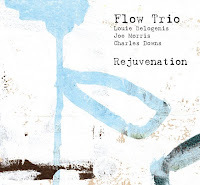 Flow Trio is a trio of seasoned free jazz musicians : Louie Belogenis on sax, Joe Morris on bass and Charles Downs (aka Rashid Bakr) on drums. The album starts with a Belogenis solo sax piece, a great introduction to bring us in the mood and to establish the setting : this will be free, yet sensitive and restrained music. The second piece confirms this. After a bass intro, the drum joins with a light touch, and Belogenis starts playing a wonderful, disturbing, wailing and weeping sax solo, carrying the whole piece and moving bass and drums along into the same subtle trialogue of barely sustained fragile notes. The third piece, "Pick Up Sticks", is more Ayleresque, with more power in the sax, yet keeping that plaintive tone, that paradox of agonising relief, supported by the rhythm section's possibly most difficult part of the album, keeping the rhythm while avoiding real patterns. "Succor", the fifth track, is another highlight, with Morris playing arco, and playing a great solo, Belogenis moving into more avant-garde cut-off phrases, while Downs has picked up his brushes. You get the drift, emotionality, spirituality, openness, musical explorations and lots of self-discipline. It's the trio's second record, and I prefer it to their live debut album. It's also a great addition to the ESP catalogue, which brings a good balance of re-issues of great jazz works with more modern free jazz. Let's remain in India for a while, and also with David S. Ware, who despite his disease, keeps being productive, and not only that, he keeps delivering high quality. 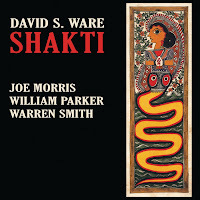 I may be wrong, but I think this is the first CD ever in David S Ware's long discography without keyboards, originally that position was held by Cooper-More, later Matthew Shipp, but the harmonic instrument is now Joe Morris's guitar, an interesting choice which gives the music a new dimension. William Parker is on bass as usual, but now Warren Smith plays drums. Changing the piano for the guitar does not only give the music an overall lighter, less dramatic touch, it also reduces the density of the music, as Morris does not regularly plays accompanying chords. But most important of all, Ware's sax-playing sounds warmer, less angry, more composed, yet as passionate as before. And the combination works well because of the contrast between the depth of Ware's tenor and the single note runs by Morris, and both are very melodious and lyrical, which is especially for Morris a great thing to hear. Warren Smith also creates a difference, he has a light and subtle touch, playing very creatively. And Parker ... well, there's no comparison, powerful and precise, emotional and outside, adding unusual but the right touches, whether pizzi or arco. And Ware gives his fellow musicians also space to improvise, which was not always the case on other releases. The album's relative calm and controlled atmosphere does increase the tension, together with the emotional power and spirituality. One minor thing: I hate fade-outs, especially in the middle of a solo which sounds great. One more great album of the same high level as most of his impressive discography. Listen to samples and buy from AUM Fidelity. This album has all the ingredients of good world-fusion jazz: odd-metered rhythms, sudden tempo changes, the blend of different scales, excellent musicianship, varying between sensitive moments and break-neck speed unison phrases, and - usually a rare commodity in the genre - good taste. 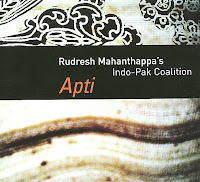 The Indo-Pak coalition consists of Rudresh Mahanthappa on alto saxophone (of Indian origin), Rez Abbasi on guitar and guitar-sitar (of Pakistani origin), and Dan Weiss on tabla (of US origin). Those who are familiar with Mahanthappa's other releases, will find a different approach here. The long, often complex, highly energetic music we know from his own releases or from his collaborations with Vijay Iyer, makes place for a greater accessibility, with some tracks which are even sweet and mellow, such as the long "Vandanaa Trayee", and "Adana", the next piece. It is all very carefully crafted, with lots of precision in the playing, leaving controlled room for improvisations, and keeping on the safe side of explorations, although the blend of genres between Indian music and jazz is well made. The best pieces are the fastest ones, like the long "IIT", which even has a few classical music phrasings in it, or the yearning "Baladhi", which mixes great composition with beautiful emotional soloing. "You Talk Too Much", the last piece, ends the album in overdrive, at nervous superspeed, no doubt a crowd-pleaser at live performances. Many other musicians with the skills of this trio fell and fall into the trap of demonstrating their shownmanship for the sake of it. It's a delight to hear how the Indo-Pak Coaltion keep their focus on the music itself, on the interplay. The sheer musicianship makes this already a really enjoyable album, the quality of the music lifts it a level higher. That being said, I like my music a little rawer. In previous reviews, I have referred to Swiss trumpeter Erik Truffaz as the epitome of commercial jazz. I liked his music many years ago when he was a Miles Davis clone, starting to work with more modern concepts. Since then, he has started releasing records that go in all musical directions, electronics, world music, nu jazz, but always with a very sugary sweet commercial approach, creating fusion upon fusion with other genres, often for lack of new musical ideas. Now he has released another set of new albums, that can be purchased together as "Rendez-Vous", a triple-CD set, with one CD together with Sly Johnson, another one called Mexico. Both of those are to be forgotten immediately (and probably will). Luckily, the third one, "Benares", is also available separately, which saves costs. The album is a delight. Especially for Indrani Mukherjee's wonderful singing and Apurba Mukherjee tabla-playing. But Malcolm Braff's sympathetic piano-playing and Truffaz' mainstream trumpet accents add a nice jazz flavor to the music which fits really well. Real fans of traditional Indian music will possibly be frustrated by the intrusion of the piano and the trumpet, and true, the record is really carried musically by the Mukherjees, yet the combination works well. 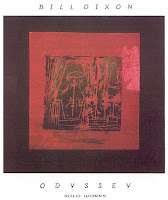 There are three studio performances, and two pieces that were recorded live at the Cully Jazz Festival in Switzerland. Truffaz and Braff spent two months in Kolkata (Calcutta) studying Indian music with the Mukherjees, then inviting them for a tour in Europe. 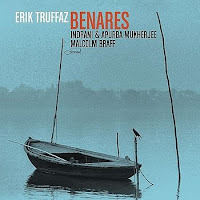 What remains a mystery to me is why the album is called Benares, now known as Varanasi, if the musical influence is primarily from Kolkata, which is a few thousand kilometers away. Listen to samples on Truffaz' website. The pieces on YouTube are not representative for the music on the album, which contains luckily much more singing. 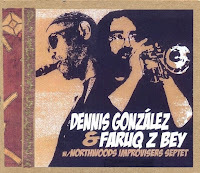 Dennis González nor Faruq Z Bey may be the most memorable instrumentalists on either trumpet or sax, but what a musical feeling both musicians have! They are both eclecticists with a broad range of musical styles in their baggage, yet they manage, at least on this album, to create a very focused, very soulful and emotional warm sound. The album is created in tribute to one of my own favorite trumpeters, the Polish magician of melancholy, Tomasz Stanko. 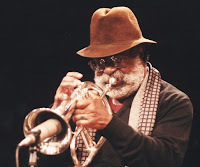 Stanko is one of the best trumpeters and musicians of the past decades, someone who has been able to create his own signature sound, which delves into the deepest levels of sadness and melancholy. His great achievement is to do that without resorting to cheap sentimentalism. His music is absolutely creative and fascinating. Now González and Bey move into the same kind of territory without trying to copy Stanko either. Most of the music is slow to mid-tempo, with great themes, creative ideas and excellent improvisations, but the main achievement lies in the solidity of the band's common construction of the pieces. The band further consists of Mike Carrey on tenor and bass clarinet, Skeeter Shelton on tenor and soprano, Mike Gilmore on vibes, marimba, saz and tamboura, Mike Johnston on bass and percussion, and Nick Ashton on drums and percussion. 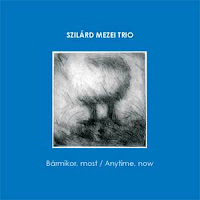 What makes this album great, is that the musicians manage to capture Tomasz Stanko's melodic sadness, while incorporating it into their own music. The four horns create a warm blanket of sound in perfect symmetry with the sustained polyrhythmics of the rhythm section, leading to a music which moves forward in great waves of sound, flowing like the sea, unstoppable and hypnotic. 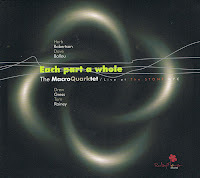 "Hymn For Tomasz Stanko" starts with the title track, with bass, drums and sparse vibes, followed by a grand sweeping theme, dark and ominous, leading the way to a sequence of solos and repetition of the theme, with especially Gilmore's sparse vibes giving a wonderful atmospheric touch to the overall sound. The second track "Hu-Nu" has a wonderful counterpoint build-up, laid over a halting rhythm, quite inventive and very effectful, and is followed by a less orchestrated, free-er, more open composition, on which none of the instruments ever play together, but rather weave several phrases together, as suggested by its title, "Calligraphy". "Kuntu" is pure sustained African rhythm, with a steady bass vamp, a great theme and excellent soloing by González, Gilmore and especially Bey at the end of the track. "Namesake" is a piece which first appeared on the Silkheart record with the same name in 1987, which now starts with a slow unison theme before the bass vamp kicks in at a slightly higher tempo, supported again by great drumming. Again, this is a hypnotic piece with a great sequence of solos. The last track, "Ilam", moves us from Africa to more Middle-Eastern music, with a saz intro by Mike Gilmore, followed by his playing the tamboura throughout the piece. The theme that follows is slow, sad and deeply moving, again with nice soloing and aptly ending with one by González, on a tune that could have come from Stanko. In short, a great album, in my opinion of the same expansive and broad-sweeping level as his Nile River Suite or "Dance Of The Soothsayer's Tongue". The overall sound is very coherent, all tracks are of the same high quality, melodic, lyrical and creative. I love it! The album is available as a 180 gram vinyl LP, or as a limited-run gold disc CD. To order, just send an e-mail to Dennis González at : dennisgonzalezx@aol.com. This is an urgent notice on David S. Ware’s health. David needs to find a kidney donor. David S. Ware was diagnosed with kidney failure in 1999 and he began dialysis that fall. He had an intensive three week hemodialysis regime toward beginning peritoneal (self-administered) dialysis, which would allow him to travel. David has been on this self-administered dialysis regime multiple times every day and night since October 1999. While certainly difficult, he has been able to travel, and perform his music undiminished, since then. However, late this past December, David called to say that after 9 years this treatment was no longer working as it had been, and that a kidney transplant is the only viable option for his survival. Since then a number of friends and family members have offered to give him one of their kidneys. Unfortunately, they have all been disqualified due to health reasons or not having David's blood type, O. Some basic/initial requirements for viable donors are that they must be under 60 years of age, do not have diabetes or high blood pressure, are in general good health, and have blood type O (either O+ or O- is fine). We will then get them directly in touch with the Kidney Transplant Center at RWJU Hospital to begin the screening process for donor viability. please feel free to forward this notice. A retrospective view on the musicians that will make me remember 2008. 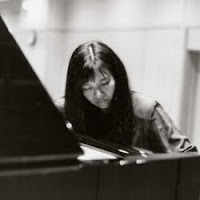 The Japanese pianist is not only a prolific producer of new material, her range and sense of adventure is equally broad and deep. A person who understands the true power of music, and who keeps looking to make even more powerful statements, looking in new forms, line-ups, traditions, trying to even surprise herself with the outcome of it. Despite her very unrelenting search, she is also sufficiently open to the ideas of other musicians, as with Larry Ochs or Carla Kilhstedt for instance, two musicians who would at first sight not appear to be her typically expected band mates. The trumpeter has always had an approach that kept him out of the spotlight, yet continuing to release new material, very stubbornly and very visionary, bringing jazz deep into avant-garde territory where every name of genre becomes a redundancy. This year, 2008, 83 years old, he still release two albums of high musical significance. The first with the Exploding Star Orchestra, the second his own "17 Musicians In Search Of A Sound : Darfur".... still creating things and listening experiences that no one has heard before. An amazing feat. Believe it or not, there was a time when I could not listen to Trio X. That was in my "melodic" period. If I flipped through the CDs in record stores, I jumped right to the next band or musician. Today, I have their entire collection. In 2008, they released Live In Vilnius and the 10 CD box of their US Tour 2006. McPhee, Duval and Rosen keep doing what they're doing well. That is : perform. Sure, many of their songs are the same. The performances are never. There's also a nice DVD that gives a part of the Vilnius performance. Hours and hours of musical joy they gave me this year. I thank them for that. ESP records did a great thing last year to re-issue the two previously recorded performances by Don Cherry, issued by Magnetic Records. 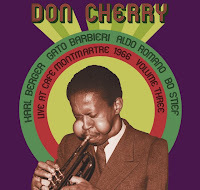 Those performances were made at the Club Montmartre in Copenhagen, Denmark where Don Cherry resided for a month in 1966. The band here is the same as on the two other recordings : Don Cherry on trumpet, Gato Barbieri on sax, Karl Berger on vibes, Bo Stief on bass and Aldo Romano on drums. The performance on this CD was not released before, and it is chronologically the first one. The two tunes on it are actually part of the same suite, called "Complete Communion", which is the title track of the studio recording made earlier on Blue Note. Cherry was a joyful person, a spiritual person, open to the world and to new ideas, and often with an attitude of "anything goes". All these characteristics are already apparent on these early recordings. His "suite"-like compositions consisted of previously agreed themes that were launched by him, then there was improvisation until he started with a new theme. These sudden shifts sometimes take the other musicians by surprise, as can be heard especially on the live recordings. The sound quality and the "arrangements" if one can call it that, are much better on the Blue Note studio recording, but the live performance has this open attitude allowing for less perfection, but with a higher sense of authenticity, and joy of the musical interplay, and that is clearly demonstrated also by the more open structure of the pieces and clearly also by the total lack of restraint with which Barbieri plays sax (there clearly was no producer present to make him consider sales!). This openness allowed also for the easy introduction of other themes, as he does here, adding a theme by Antonio Carlos Jobim in Complete Communion and adding a theme by Ray Brown in "Remembrance", the second track. There is not much new to be heard, and for those who don't know Don Cherry's early work, I would still recommend the Blue Note release, but for Don Cherry fans, this one is a great addition to the Montmartre series. Last year Serbian violinist and viola-player Szilárd Mezei released a quite succesful album combining wind, strings and percussion instruments for quite an interesting musical exploration. Now he's back with fellow compatriots Ervin Malina on bass and Istvan Csik on drums. Mezei's approach to music is an interesting mix of rhythmic and melodic composed elements, with references to modern classical, bop and European folk, interlaced with avant-garde improvisations. His viola has a raw, yet warm sound, and is really at the center of the music, determining the sound, the development of the pieces and the structure of it, while the bass and drums generally placed in a supportive role, although luckily not always. The nine pieces all have their own coherent focus, despite the excursions made here and there. But what is mostly astonishing is the permanent slow to mid-tempo pace, totally unhurried, and lacking much of the nervousness you would expect from jazz. And even on the mid-tempo tracks, the three musicians take their time to build up, to elaborate, to solo, ... what they bring is the opposite of instrumental pyrotechnics, despite their obvious skills, using few notes to tell the story, focusing all of the listener's attention on the qualitative impact of the tonal shifts and thematic development, giving the whole album a quite dramatic sound, full of pathos. I have this very hard to explain ambiguous attitude towards this kind of new music. I know people who get absolutely wild over Keith Rowe's recent music, while for me it's hard to appreciate it, because nothing happens (I know, some say a lot is happening, but it's too subtle for the likes of me to understand, which might of course well be the case). This record, by AMM, with Eddie Prévost on percussion, John Tilbury on piano and John Butcher on soprano and tenor saxophone, really is great. True, like much of this kind of music, it is barely touched silence, but the sensitivity, the quiet elaboration, the inimaginable self-control, the aesthetic beauty are absolutely rare. As you might expect, most of the time the instruments do not sound like themselves, creating new textures, new voices, new timbres, eery, pleading voices created out of shadows and early morning fog. But then at other moments it sounds industrial like some heavy grinding unoiled machinery, or organic like blood flowing, birds whispering, flowers weeping, trapped animals screeching, mongooses fornicating, ... but whatever it is, there is tension, there is something going on, providing for a captivating listening experience, even if is hard to describe and difficult to place. And on top of all that, there is a piano to hear, and a sax, and percussion. For almost 45 years this band (or duo?) has managed to keep the interest going, keeping their positioning intact of making music that is not influenced by anything else, including the need to create imagery with references to the real world. After so many years, it still does have that approach and it still sounds like nothing you've heard before, which is by itself a remarkable feat. So leave all preconceptions aside, stop rationalizing, stop fantasizing even, and listen to this, get sucked into this musical universe and marvel at it. (And AMM stands for "Audacis Musicae Magistri", which is Latin for "The Masters of Audacious Music"). After two years of existence, this blog has today reached 200,000 unique visitors. I'm sure many of those visitors got lost on the internet and reached this site by accident (possibly looking for "free" jazz in the sense of not having to pay for it). Nevertheless, I hope they got interesting insights and kept returning. And that is the real benchmark. We have now reached a still increasing average of 5,000 unique returning visitors per month. By internet standards, that's peanuts of course, but for this kind of music, that's not bad I think. Many reviews of this blog have also found their way to musicians blogs and sites (Joe Fonda, Michael Dessen, Dave Douglas, Chris Kelsey, Denman Maroney, ...), may it help them to widen their audiences. My mission remains to promote great music, to share information on new records that are released, in the hope that the musicians get better and wider recognition, and in the hope that you, listeners, will have a broader selection to choose from. A great thanks also to all the labels and musicians who keep sending me their material. Two new reviews of the sax-drums duo format. Two albums which are close in their improvised approach and musical freedom, one sounding very European and the other very American, although some tracks might be exchanged from one to the other, and people with untrained ears will probably not be able to tell the difference. 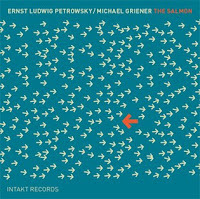 The Salmon consists of 11 pieces of great interplay between saxophonist Ernst-Ludwig "Luten" Petrowsky and drummer Michael Griener. The album starts in the way you would love such an album to start, right into the core of things, straight to the essence, no holds barred. Petrowsky is fierce, energetic and sensitive too. Griener is fierce, energetic and sensitive. This sensitivity is the essence of the second track, called "The Salmon 2" (no creativity in the titles), on which Petrowsky plays long deep-toned passages, with Griener accentuating subtly. Petrowsky almost comes to a theme, yet rapidly kills it, for fear of creating a melodic pattern, keeping freedom and openness, without falling into dissonance or empty squeeks and squeals. This is music that breathes, that is direct, soulful and wild, yet both men have something to tell. I like the format for that reason, as it often works. I recently downloaded this album from iTunes, although it was released some years ago. Like Petrowsky, Andrew Lamb is also an autodidact, who got formal training later on. He is accompanied by Warren Smith, who, like Griener, is a master of minor subtleties and a deep soulful approach. The Dogon are an African tribe in West Africa, mostly in Mali and Niger. With that as a context it's not surprising that African rhythms and melodies dominate the music, but then in the free-est of ways. 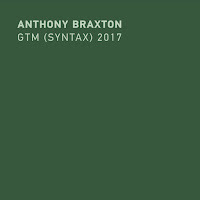 The first piece starts with odd, pounding polyrhythmics by Smith and a soaring sax, sounding like a mixture of Kalaparush McIntyre and Dewey Redman, warm, free, rhythmic and lyrical. The role of Smith in setting the scene is crucial on many tracks, as on the title piece. There is quite some variation, with Lamb switching to flute or mismar once in while, but also in the musical approaches. There are some slow spiritual pieces ("Lake Tanganyka" with Lamb blowing on bottles), alternated with wild tribal dance music, and wild spiritual pieces ("Call Of The Spirits"). Again, I like this format. And this CD also delivers the goods. 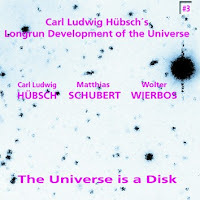 This band's actual name is "Carl Ludwig Hübsch's Longrun Development of the Universe", but there wasn't enough space to put it in the title. The band consists of three brass players: Carl Ludwig Hübsch on tuba, Matthias Schubert on tenor saxophone, and Wolter Wierbos on trombone. On last year's "Primordial Soup", Hübsch opened for me new doors for listening to music, creating a musical universe which had depth and a wonderful attraction without using traditional musical reference patterns. This album is much more intimate, yet it is as bizarre as its predecessor, but then in a totally different way. Hübsch uses traditional jazz tunes and harmonics, with unison lines and solos as if he's trying to revive the old New Orleans music in a modern dress, but then suddenly there is some theatrical dialogue in German between the three musicians, followed by real avant-garde stuff of the kind that is only a slight whisper away from silence, and this played by the three instruments together. The dialogue itself is fun, contradicting, arguing about the tune's itself, which was played perfectly, and once they agree, the unison line gets lost. The theatrical, almost zappaesque effects, come back in "Another Determinator", with humor in the music itself, in the texts and in the way the shouts and music interacts. As with the jester, you're always taken by surprise, the music changes the whole time until you've lost your footing, until you don't know what is what and which is which. 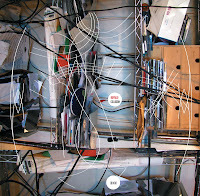 Tracks like "Floating Fragments 2", are clearly composed, with definite pre-conceived anchor points scattered across the track in an assymetrical structure, with in between moments of fun or agonizing or beautiful or experimental sounds. "Floating Fragments 3" is pure avant-garde, with sounds that hold the middle between a jungle at night and the music of the spheres. Some tracks are really interesting sound explorations for three brass instruments, but also musically. Yet this trio questions as it creates. It pierces the illusion they've gradually built up over the album. And believe me, there are some great listening moments. Which are then questioned. The last track "Elephantenrunde", brings us back to the trialogue in German, questioning each other in an argument that is to the three of them totally ununderstandable too. Their universe is not only a disk, it is beyond comprehension ("Just a moment. That was not it. What? Again? No. The silence. What? Your place? Which place? The one from before? Mine? No mine. The one from much earlier? Which one? Again? That was another one. Pedantic. Me? No me! Stop! Just a second. Halt! That was not it. No. What was ...? The place. Which place?" etc. etc. or something to that extent). Absurdity kicks in, a dialogue like the music. This is not my style of music. It is too odd, and like much of music which intends to be humorous, it also creates an emotional distance. Sure, it's fun, it's enjoyable, but never gripping. On the other hand, what a delight to hear so much self-relativation from avant-garde musicians. I don't really like their project, yet they deliver it perfectly. There is a booklet that goes with the album, but which I didn't get because I downloaded the music (so don't shoot me if I misunderstood the music or the German conversation). Listen and buy/download from Leo Records. A month ago I praised Polish clarinettist Wacław Zimpel for his playing on "The Light". Now he teams up with Tim Daisy on drums, whose quartet release "1,000 Lights" I reviewed only yesterday. 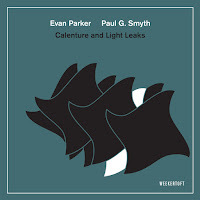 Seems like these guys have found each other under the right luminiscence, for this duo outing, which is expanded by Dave Rempis on alto and tenor saxophones, and by Mark Tokar on bass on two of the seven tracks on this album. 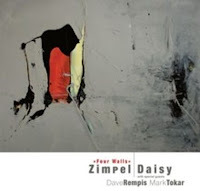 Both Daisy and Rempis are members of the Vandermark 5, yet here there music is more abstract, more free, moving in the direction of what I heard of Zimpel and Tokar before. There is rhythm for sure, there is melodic tension, but very implicit, painted in broad strokes, leaving lots of opportunities to change, alter, accentuate, dialogue, and crackling with anticipation and subtle touches. And if Zimpel and Daisy manage to create wonderful interaction on the five duets, Rempis and Tokar add a dimension to the music, with "Chorale" as the highlight. If you listen to the album in one go, it moves from the light-footed and intense duets into two more dramatic, darker quartet pieces, even if one is called "Basement Of Joy", ending more light-footed again with the last duet, which is a second take at the opening track. The record comes with the enigmatic message that the music was recorded live at the Alchemia Club in Krakow, but without public participation. The meaning of "live" has apparently been altered without notifying us. Solo trumpet CDs are pretty rare. And the music on them especially, often very experimental, looking and searching for the extreme extended sounds you can get out of the instrument or looking for microtonal or electronically distorted possibilities. If you are an adventurer, you will like to listen to some of the records below. Markus Stockhausen and Hugh Ragin are the most accessible. Some of them are plain weird, and will only be of interest to trumpeters who are looking for interesting new angles. Anyone with suggestions for other albums, please let me know. When I first heard the beginning of the first track, called "Falling Rocks", I thought this was one CD to dismiss quickly, when heavily distorted rock guitar sounds, a pumping bass and wild drumming tortured my sensitive ears, yet this initial violence makes soon place for a great soft, gentle and sensitive trumpet solo. Creative contrasts form the core of these carefully crafted compositions. 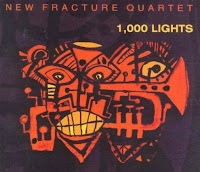 The Chicago-based band "New Fractures", led by drummer Tim Daisy, well-known as the drummer of the Vandermark 5, further consists of Jaimie Branch on trumpet, Dave Miller on guitar and electronics, and Nate McBride on bass. And this line-up is great for the band's musical vision. As their name suggest, they break things to pieces, yet they create something in the meantime. McBride and Daisy form a formidable rhythm section, creative and supple, yet leaving the frontline to two young musicians, whose playing is surprisingly mature. Jaimie Branch is a strong trumpeter, with a clear and warm tone, and an incredible musical presence and personality for a 25-year old. She surely is someone to watch, as is guitarist Dave Miller, whose range and creativity are also very promising. Anyone can play loud and distorted, but I prefer him when he plays with the sensitive touch with which plays "1,000 Lights", the title track, or when he uses his wealth of clear-toned ideas to add to this great rhythmic and open music, as in "No Fires". This is free jazz, but rhythmic, melodic, with strong compositions while keeping that sense of freedom and expressivity that makes the genre so interesting. This band gives you the feeling that anything can happen. And it does, yet remarkably, and very unusually, the whole thing remains quite coherent, despite the often abrupt style variations. Four musicians with a story to tell. I like it. Music can be great in little things. What a great and intimate musical interaction between two artists who understand each other well this record is! 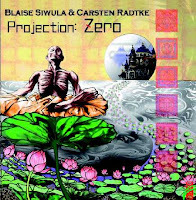 Blaise Siwula's alto and Carsten Radke's guitar seem to be made for each other, both in tone and in musical approach. They also demonstrate how improvised music can go well beyond any patterns and harmonies without sounding dissonant. Quite on the contrary, it is at moments amazing to hear how they create the piece together, moving in the same direction, coming together even without falling into patterns. This is gentle, sensitive, organic music. Because they had no preconceived notions when starting to play, they called it "Projection: Zero". Both musicians are also interested in Zen Buddhism, and the first track is aptly titled "Wu Wei Ways", describing their approach to music, with Wu Wei being the state of "action without action", to let things move with natural grace, without forcing things, let things grow out of themselves. And this latter organic thing is precisely what you hear. Siwula listens to Radke, Radke listens to Siwula, notes and phrases, sometimes rhythms are created, repeated, echoed, supported, expanded, ... gently, subtly. That does not mean that everything is always nice and peaceful, or slow. There is speed at moments, there is tension too because many unexpected things happen, yet it is because of this that variety and sometimes differing views that other and new things happen, but in full control, with lots of disciplined freedom. Masterful. Listen to samples on Siwula's MySpace. I have always liked Michael Marcus' knack for lyrical improvisation, and on this album he does it again, but now restricting himself to the Bb clarinet. The album is a mixture of line-ups and styles, starting and ending with the beautiful "As Always, Our Blessing", a tune which could have been composed by Coltrane, magnificent in its expansiveness and paced development. The musicians are Antoine Roney on tenor sax, John Austria on piano, Radu ben Judah on bass, Rashaan Carter on bass, Taru Alexander on drums, and Jay Rosen on drums, and this, in various configurations. The second track is more boppish trio, with an angular theme. The third is a quartet with Antoine Roney on sax, a great theme, but the volume between sax and clarinet is unfortunately not quite right. "Elipsis", is a slower ballad-like tune, nice but nothing more. 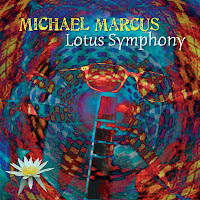 Apart from the title track, two other tracks are great : "Sumatra", and "Lotus Symphony", both trios, and built around long and beautiful themes, and it is on those pieces that Marcus is really at this best, expanding on the theme, improvising freely and without boundaries, yet still focused and in line with the theme. Starting and ending the record with the same tune, is a nice trick to give an impression of unity, yet it's unfornutately absent, not only because of the variety of line-ups, but also of the compositions and sound quality. Yet there are great moments. 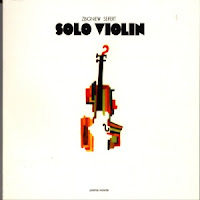 Apart from Leroy Jenkins' Solo Concert from 1976, I do not think that there are many solo violin albums that fall within the broad "jazz" genre. You could also argue that Polly Bradfield's "Solo Violin Improvisations" from 1979 is jazz. 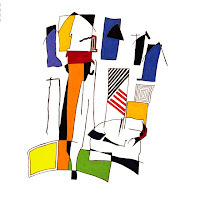 Now Polonia re-issued this album by Polish musician Zbigniew Seifert. Seifert was a classically trained violinist whose musical world opened when listening to Coltrane. He switched to sax shortly, then moved back to violin, trying to capture Coltrane's timeless expressivity and open esthetic. On this album, you can hear this Coltrane influence, together with a modern classical touches and even some European folk. His improvisations range from the very abstract to real rhythmic jazzy, from sad to joyful. On two tracks, he dubbed some additional violin, as a kind of background support, or even drone. Seifert died in 1979 at the age of 32 and he did not leave that many records. If you search for this record on internet, download links can be found all over the place. PS - I got the additional information that Billy Bang released a solo violin album, "Commandments" (No More Records 1997), as did Malcolm Goldstein "Live In Fire In The Valley" (Eremite 1997). Thanks Pedro for the info! Many years ago I switched on the radio and I heard this repetitive violin sequence, which just kept repeating and repeating itself, with once in a while a little change: it was both hypnotic and ununderstandable. I was hesitating whether it was a stuck record that the radio channel did not notice, but that could not be it, because of those changes. I listened to the whole twenty minute piece, totally mesmerized. It was Philip Glass's "Einstein On The Beach", a wonderful record, a unique listening experience. One of the things that truly get me is what madness, what unbelievable concentration it must require from the musicians to play these lengthy pieces with so little variation. In the meantime, Glass became more famous than any other current classical composer, maybe next to Michael Nyman, because they both write film scores. 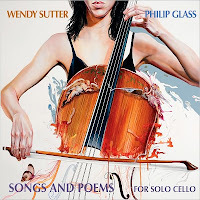 Now there is this "Songs And Poems", written for solo cello, and one not to be missed. Unlike many other Glass compositions, the music is hardly repetitive. There are repetitions of course, but then more Bach-like, as musical patterns to play with and explore. As can expected from pieces for this instrument, there is some melancholy to be heard, some dark feelings even, in the middle part and towards the end, but the overall trend is classical in its severe structural approach, its finesse and refinement. Wendy Sutter, also a cellist in "Bang On A Can", is absolutely fabulous on this album: precise, sensitive, and with a great sense of pace. Sutter plays on her "ex vatican stradivarius" from 1620, a unique instrument with a deep and very warm sound. So far so good, then comes the cold shower: the last four tracks are no longer solo, but pieces from "Naqoyqatsi" that were not used in the movie, on which Sutter is accompanied by David Cossin on percussion and by Glass on piano. Those pieces create a bizarre musical conflict with the rest of the album. They are totally different in style and approach, more romantic, less austere, less dramatic. I find it mind-boggling that labels can be so stupid and irrespectful, to musicians, but especially to listeners, to break the coherence of such a wonderful album. Nothing wrong with the last four tracks by themselves, but the context is totally wrong. It's like adding some unused Beatles '62 tracks to Sergeant Pepper's just because there was some space left at the end of the album! Who cares if the album is just thirty minutes long? As long as it's good! It drove me up the wall when I heard those additional tracks. And truth be told, I find the terribly kitschy artwork on the album cover as repulsive, and again in total contradiction with the quality of the music. But that should not deter you from buying this album. Do like me: re-record it and delete the last four tracks. You will be holding a true gem in your hands. Listen and download (the first 7 tracks) from iTunes. "Les Amants De Juliette" (Juliet's lovers) is a French trio with Serge Adam on trumpet, Benoît Delbecq on prepared piano and Philippe Foch on tabla and percussion. Their musical universe is a great fusion between world music, modern minimalism, and free jazz. This is their fourth record so far, released on the French label "Quoi De Neuf Docteur", but now available on eMusic, together with other releases by the same label, and it is more than worth listening to. Adam is an excellent trumpeter, who has been active in various bands, ranging from traditional jazz over folk music to more experimental music. This trio is something special. It reminds me of Codona, with Don Cherry, Nana Vasconcelos and Collin Walcott in the joy of its music, although this trio is a little more intellectual in their search for new form and complex overlapping rhythms, it also reminds me of "Agbalagba Daada" by Per Jørgensen and Terje Isungset, although is a little less folksy/shamanistic. Foch's percussion is excellent, and although his tabla often gives the music an Indian sound, the rhythms are not (necessarily), influences abound, as do creative approaches. Technically, Delbecq's piano-playing is probably the most discerning element, and surely the most unorthodox, with muted strings, tantric left hand repetitions, interesting melodic try-outs, or percussive playing, often sounding like an African string instrument rather than a piano. And although it's not a new release, it's a great one to start the year with : open to the world, light-footed, creative, and full of hope and joy. Go To Quoi De Neuf Docteur for more information on Serge Adam's multiple projects. Watch them on Youtube (bad sound and image).